These cool products have secret capabilities and are awesome! Skootcase- is a ride-on with fully functional steering scooter that opens up to a suitcase, perdect for a toddler. Cost: $62.99 at Amazon. For all mini fashionistas, the Skootcase is a ride-on scooter and pull along suitcase that makes travelling with kids easier and much more stylish. Designed like a cool Italian scooter, the Skootcase is a ride-on with fully functional steering and enough room for your child’s favorite things. The sturdy rubber wheels are great for any surface, from zooming around home, around the neighborhood or through the airport. The carry-on sized Skootcase fits in a plane’s overhead bin and features a sturdy tow strap that makes it convenient to throw over your shoulder. The Skootcase stores enough for a weekend away with clothes and their much loved teddy. Children will love having a special storage space all of their own. Winner of Dr. Toy's Best Vacation Products Award. Head to Amazon.com to buy! A compact container for emergency preparedness, or reducing bulk when on the go. Keep money, medicine, vitamins and other stuff close at hand, and protected from the elements. It's made from a solid piece of metal, and has a large clip at the top for fast attachment to key rings, cords, zippers, and more. Simply twist off the end to open the container, and then insert anything that fits. The threaded opening is nicely secure, and an added sealant ring prevents water from entering. A spring loaded closure guarantees a strong hold that doesn't fail, and the aluminum material keeps it lightweight and unnoticed, without reducing durability. Hold some cash for snacks at the beach, carry important medications when flying, or bring along supplements when taking a hike. It's the ultimate travel accessory for tiny stuff that's important because it offers protection, security and convenience in one compact package. With a carabiner style opening that also doubles as a bottle opener, the Travel Stash makes the perfect addition to any key chain, backpack or purse. The Shot Flask is a flask that comes with a popout shot glass too! Cost: $30.39 Head to Firebox to buy! 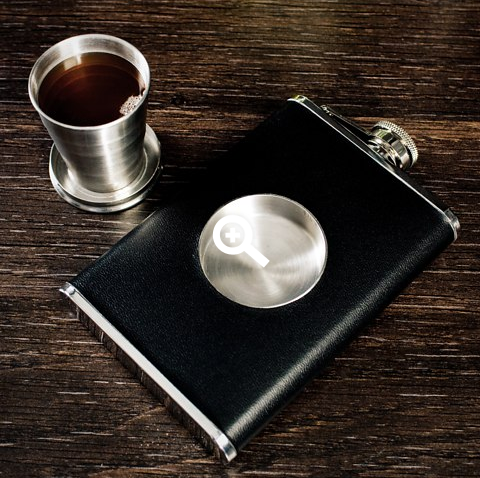 For fans of secretive swigging or anyone who enjoys grabbing a quick gulp on the go, there’s nothing quite like a hip-flask. Sure you could just carry a keg on your shoulder, but it’s not very subtle and nowhere near as classy as the Shot Flask. But this is not just a gorgeous, leather-wrapped, stainless-steel hip flask, no sir. 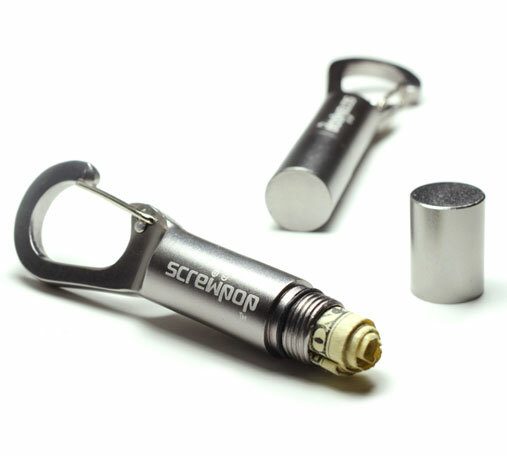 The Shot Flask features a collapsible 60ml metal shot glass that can be stored in a recess on the flask itself. Looking like an embossed badge, the shot glass pops out and extends telescopically to give you a solid 60ml cup. So you can share a toast with your mates, and not need to worry about the mess. We’ll drink to that. 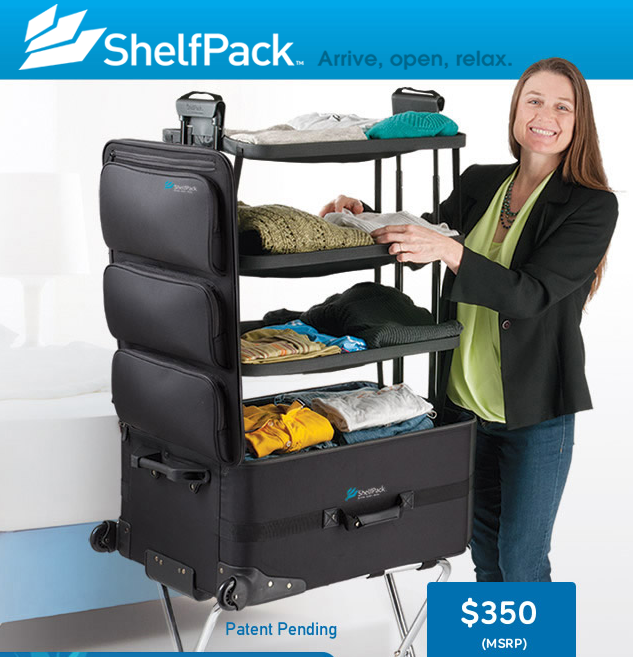 Introducing the ShelfPack, a new kind of luggage with built-in shelves and an innovative, patent pending design. The shelves and front pockets keep your gear organized, visible and easily accessible. Cost: $350 Head to Shelfpack.com for more information and or to order yours today! It’s perfect for families, business travelers, vacations, cruises, camping and road trips, even home storage. It’s a portable closet. According to Digital Trends "Shelfpack. It’s part suitcase, part shelf. Just unzip your luggage, pull up, and voilà! — it morphs into a pop-up clothing shelf, which means no unpacking or sorting through articles of clothing for you." 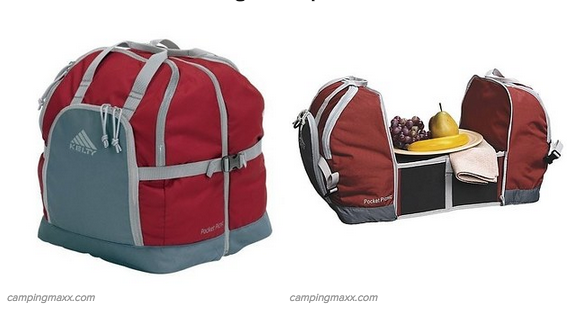 Kelty Pocket Picnic is a cooler and table in one! Cost: $20.00 Head to Camping Maxx to order! For easy outdoor dining, try Kelty's Pocket Picnic storage and cooler combo. . . a cooler on one side, dry storage on the other, and a fold out prep table in between. The watertight cooler can hold up to 20 (12 oz) cans, and the built-in fold out table provides a solid surface for food preparation, eating, and playing games. It's compact, versatile and easy to transport.? Ottoman Bed - you guessed it, is an ottoman turn bed! Cost: $219.99 Head to Amazon for more information and or to buy. Guests have a comfortable place to spend the night when you unfold our Ottoman Bed. Clever brown covered ottoman is great as a foot rest or table but does double duty as a steel framed foam mattress bed that supports up to 250lbs. Machine washable microfiber brown cover. Great for sleepovers, dorms, studio apartments, guest rooms and kids room. 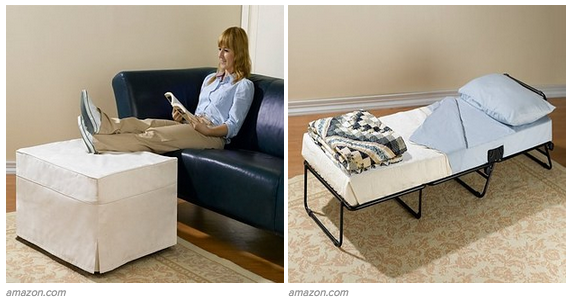 Our Ottoman measures 24.5" x 29" x 18"H closed and 75"L x 29"W x 8.5"H as a bed. Includes brown slip cover. Also available in Zebra, Denim, Linen, Burgundy, Sage and Black sold on Amazon. Secret stasher. 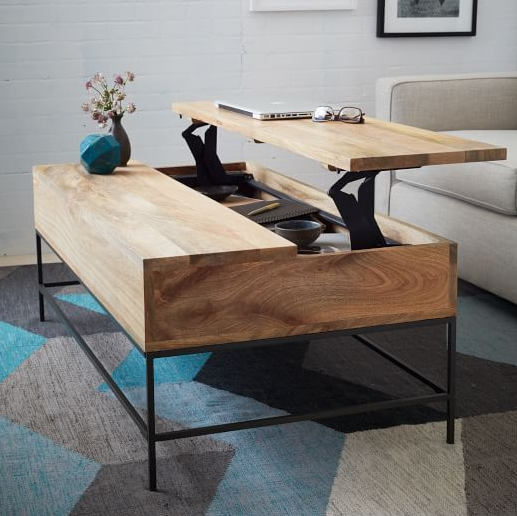 One side of the Industrial Storage Coffee Table's top pops up to reveal a boatload of hidden storage. Lofted on airy steel legs, the solid mango wood body has enough room to stow anything from toys and remotes to pillows and throws. Each table is subtly one-of-a-kind. Cost: $549-699. Head to West Elm to buy! Solid mango wood with a wax finish; blackened steel legs. Top door with pop-up mechanism reveals interior storage. Natural solid wood is known to expand and contract with climate fluctuations; door tops may not close perfectly flush following humidity changes. Grillight™ is an ingenious grilling tool that incorporates high power LED lighting into a restaurant grade stainless steel frame for a stylish look and quality feel. 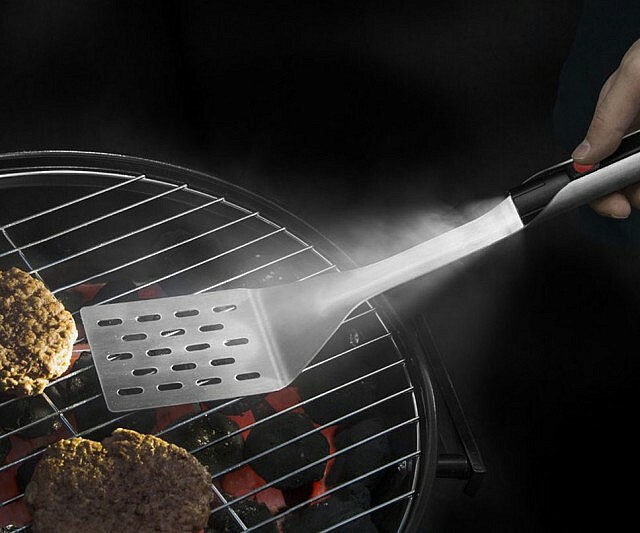 Cost: $24.95 Head to Grill Light to buy! If you have ever grilled out in the evening or just in a dark and smokey grill you know this frustration. You might have struggled with holding a grilling utensil, a flashlight, and a serving plate or you could have purchased a clip on light. Either way, you’ve probably thought, “theres got to be a better way to do this.” Well, finally there is. Grillight™ combines a high intensity LED flashlight with restaurant grade stainless steel to solve this age old issue. Don’t worry about grilling at dusk or in a dark grill ever again. We use the highest quality components all the way down to the smallest LED parts. Most grilling illuminators use cheap LEDs that put out a blueish light. Grillight™ LEDs have been precisely tuned to replicate daylight so you can see the true color of the food you’re cooking. Grillight™ grilling tools designs and manufacturers innovative grilling products incorporating cutting edge LED lighting technology. A wrapping paper, the gift wrapping paper that keeps giving! SImply wrap, then plant the paper in a pot, then watch the flowers bloom. Cost: $9.95 Head to Amazon to buy. Looking for eco-friendly gift wrapping ideas? 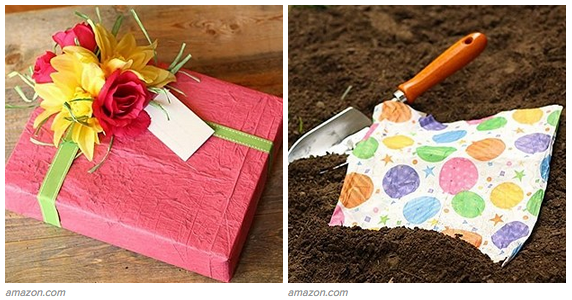 Try the Blooming Wrap Plantable Wrapping Paper. It's made in the USA gift wrap that blooms into beautiful flowers when planted in soil after use. Each sheet is embedded with 2,600 non-GMO flower seeds that will attract butterflies and other beneficial pollinators. Includes 1 seed sheet that measures 20 inches wide by 8 feet long (enough wrap for three shirt boxes!) and 3 "To/From" gift tags that also include planting instructions. Did you know that in the United States, more than 4 million tons of trash is generated each year by gift wrap and gift boxes? What's more? Half of the paper the US consumes is uzed to wrap and decorate gifts and other consumer products. Try the freshest idea in gift giving with Blooming Wrap-it's like wrapping your presents in daisies, marigolds or cornflowers! It's a gift that gives back with heart, imagination and an unexpected touch of natural whimsy. Plantable paper just needs water and soil to grow into delightful flowers-it's a gift within a gift that's a sustainable surprise every time! Size: 20?W x 8?L. Style name: Honeysuckle. 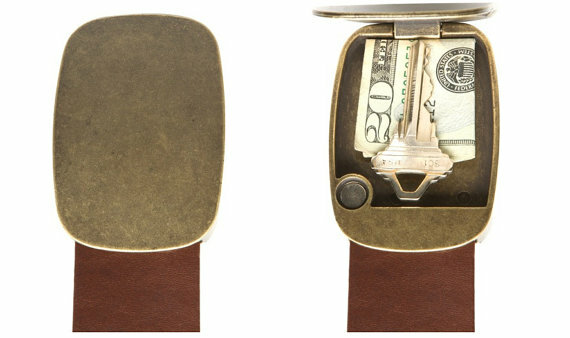 Secret Compartment Buckle is a fine leather belt with an antiquebrass finish. Cost: $69.99. Head to Etsy to buy! A high end leather secret compartment belts that stash what you need. earplugs, gum, condoms, advil, keys, cash. for Burning Man, EDM festivals, Coachella, and everyday life. Because everyone loves a secret compartment, so we decided to make a secret compartment where no one would ever expect it. Inside the buckle of your belt. Hide your cash, your condoms, your medication. Your secret. Where you can always get it. While you keep your pants from falling down. There are several rules that should always be adhered to when frolicking on the beach or lounging by the pool: never wear socks with sandals, never tie a hankie round your head and never leave your valuables on show. We’re talking about credit cards, keys and mobile phones. That’s why you need TanSafe. Cost: $12.19 Head to Firebox to buy! As you can see this clever receptacle looks just like a regular bottle of suntan lotion. Simply pop off its watertight lid, bung in your bits and relax, safe in the knowledge thieves will be unlikely to want to slather on the SPF25 after a hard day’s pilferage. Clever, eh! 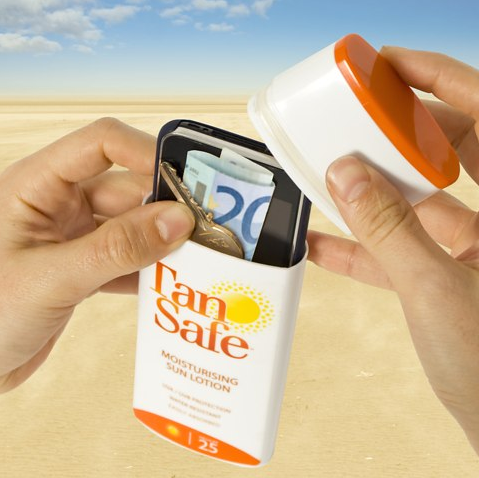 Large enough to conceal iPhones and BlackBerries, the TanSafe is set to become an essential travelling companion for canny sunbathers everywhere. And seeing as the cremated lobster look is seriously last century, nobody will bat an eyelid at your additional bottle of sunscreen. Valuable beach protection? Absolutely!